Khow Pansa is the start of the 3 month Buddhist Lent period. Begins on the full moon day of 8th month of the lunar calendar. 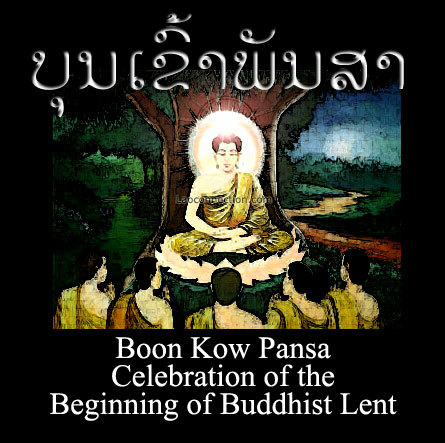 This special event is meant to commerate Buddha's First Sermon at Deer Park and the formation of the first sangha (community of monks/nuns). Buddhist followers are to visit the temple and listen on the sermon (tum boon) which earns merit. During this time, followers will also participate in tuk bat and bring food and donations to the temple. It is also a very opportune time for male lay followers to dawn the orange or white robes and become monks for a short period of time (as all Buddhist males must do at least once in their lives). Attend the Candle Light Procession (vien tien or dty tien) and circle around the temple 3 times). Monks are not permitted to sleep over at any other temple except their primary home temple. Therefore their movements are more restricted during this time. Monks are expected to focus on even more meditation and dhamma (Lao: tum) studies. Weddings rarely occur during this time. Generally farmers would be busy with the fields. This time of the year often sees some of the hottest weather in the year. 2012 is Visit Laos Year!